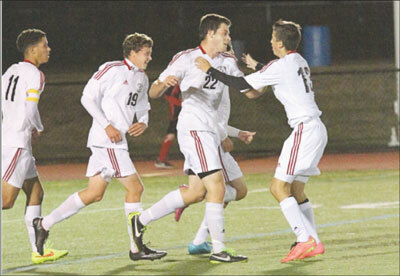 Antonio Centeio (11), Kyle Nehiley (19), Nick Haley (22) and Brian Barry (13) celebrate Haley’s goal vs East Bridgewater. Later in the game, Brian McGahan (7), upper right notched a hat trick as teammates including Ben Maines (21) and Centeio join in the congratulations. Below, Jared Pendrak makes his way to a goal. Jim Barrington is in his last season at the helm of the Whitman-Hanson Panthers Boys Soccer program. After a recent absence from the MIAA Tournament, the Panthers and Barrington look for a return to the state’s biggest stage of competition — a great send-off for their coach. Brian McGahan and company sparked a second half breakout, shutting out the East Bridgewater Vikings 5-0 on Sept. 25 — then followed with another explosive performance on offense to top Quincy 5-3 Monday night. In the first half Whitman-Hanson and East Bridgewater battled it out, with bodies flying and tempers flaring, and went into the locker room at half tied 0-0. McGahan came out of the gate early, scoring in the 44th minute off a Kyle Nehiley assist. Two minutes later the Panthers struck again as Nick Haley blasted a goal from thirty feet out, giving Whitman-Hanson a 2-0 lead. McGahan had the assist on Haley’s goal. “Brian (McGahan) played his heart out tonight and led this team to a well dissevered and hard fought victory” an electric Barrington spoke of McGahan. “His hat trick was the first Whitman-Hanson hat-trick in over ten seasons for the program, showing the magnitude of his performance tonight.” In the 55th minute McGahan netted his second goal of the night. During the 64th minute the Panthers added yet another goal as Jared Pendrak netted his first score of the season, giving the Panthers a 4-0 lead. Pendrak’s goal came on a strong cross from Brian Barry, adding to the strong showing by the junior class. Minutes later McGahan netted the hat trick off an assist from senior Jack Bannon, who started the game as the goalkeeper. Bannon, along with sophomore goalkeeper Connor Keene split the shutout, proving that the Panthers goalie situation hasn’t dwindled after the graduation of all-star goalkeeper Jason Malloy, who is now serving as an assistant coach for the Panthers. “With this victory, we are inching closer to our goal of making the tournament, and we are a team on a mission, and its hard to stop the momentum we are gaining” added Barrington on his team’s performance thus far this season. Whitman-Hanson defeated the Quincy Presidents Monday, Sept. 29, 5-3 at Veterans Stadium in Quincy, improving to 5-3-2 overall and 4-3-2 in the Keenan Division of the Patriot League. The Panthers first goal was scored by Pendrak off an assist by Antonio Centeio. Quincy tied the game on a goal by Yuri Mascarenhas at the 22nd minute. The Panthers then went ahead at the 28th minute on a goal by Tom Chmura assisted by Centeio. W-H scored again with five minutes left in the half with a goal by Centeio. The Panthers led 3-1 at the half. At the 6-minute mark, they scored on a goal by Haley assisted by Ben Mains. Nehiley scored the final goal for W-H assisted by Jared Pendrak. Quincy scored on a penalty kick at the 23rd minute by Yuri Mascarenhas. Yuri also scored the final Quincy goal at the 28th minute. W-H tied last week against Plymouth North, 1-1. The Panthers got on the board at the 11th minute on a goal by Haley, assisted by Pendrak. Plymouth North tied the game at the 30th minute on a goal by Nick Greely. Both teams had numerous opportunities but couldn’t break the tie.